After leaving the military to raise her daughter, Adams worked two and three jobs, earned a GED and eventually attended the police academy at night. She served for 17 years as a deputy sheriff in the Orange County Sheriff’s Office before she earned her Bachelor of Arts degree from Columbia College-Orlando in 2000. Her election to the Florida House of Representatives in 2002 and subsequent re-elections led to her joining the U.S. House of Representatives in 2011. Adams has received numerous awards over the course of her career, including the Pace Legislative Leadership Award, the Florida Department of Law Enforcement Legislative Appreciation Award and the Legislative Session Outstanding Service Award. Victoria Bishop Ryan emanates leadership in all she does. Her role as the director of learning and organizational effectiveness for HD Supply, Inc., demands it; her position as adjunct faculty for Columbia College in management and leadership requires she imparts her skills. In 2010, Ryan received the Chief Learning Officer Bronze Award for learning leadership. In 2008, Chief Learning Officer recognized the Learning Team with the GOLD Award of Excellence for Learning Partnership. In addition to her many responsibilities, Ryan is a researcher for the American Cancer Society, an active supporter for Habitat for Humanity and a retired long-time Girl Scout leader. Ryan earned a Bachelor of Arts degree from the Columbia College-Lake County in 1999. While Shanta Barton-Stubbs was earning a Bachelor of Arts degree from Columbia College-Orlando, her not-for-profit New Image Youth Center had already opened its doors in Orlando, Fla. Founded in 2004, New Image was born of Barton-Stubbs’ realization that the children in poverty-stricken Parramore Neighborhood needed somewhere to go. She emptied her savings account to buy games and supplies for the children, and the investment paid off — in eight years, she has gone from serving eight children to 50 children in need. At New Image, Barton-Stubbs works more than 40 hours a week without pay. Thanks to the help of outside funding, she can focus entirely on keeping the doors of New Image open. In 2011, she was nominated for the L’Oreal Paris Women of Worth and received the Leader of the Year Award from Iota Phi Theta University of Central Florida chapter. She won the title of Ms. Corporate America 2009, the 2008 Magic Maker Award and the Bank of America Local Hero Award in 2007. Like many Columbia College students, Pasley entered into his collegiate career as a nontraditional student. A 30-year-old construction worker, Pasley enrolled at Columbia College and earned a Bachelor of Arts degree from Columbia College-Jefferson City in 1987. He wouldn’t stay away for long. After earning his master’s degree, Pasley returned to Columbia College to teach history, first at the Jefferson City campus, and then at the Lake Ozark campus in 1992. Now in his 21st year of teaching, Pasley has exuded passion into the study of history, teaching and the well-being of his students. Pasley and his wife, Karen, also a graduate of Columbia College, have served as co-chairs of the Columbia College-Lake of the Ozarks Advisory Committee since 2009. Pasley also is a sought-after expert on history, regularly speaking on radio stations, at schools and in the community. 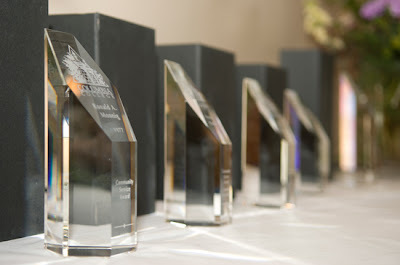 This year's recipients will be honored at Reunion Weekend 2012. The Alumni Awards Banquet and Presentation will be held on Saturday, April 21, at the Dulany Banquet Room. For a full schedule of events and to register to attend the awards banquet, visit www.columbiacollegealumni.org/reunion. For further information about Reunion Weekend, call the Alumni Relations office at (573) 875-ALUM (2586).